"We are unable to build this product at this time, please check back later"
I thought I had read some where that they were building sails for other lofts as well as there own. One of the lower cost areas in California to live and work but its probably still tough making ends meet running a sewing machine 8-10 hours a day. At least in the loft I worked in only the owner was really doing okay financially, I mean the other employees were fine but had spouses who made good money and they weren't living waterfront. 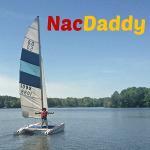 I ordered my NACRA 5.8 tramp from them. No issue on delivery. Took a couple of weeks but the best product ever. Worth the wait, if there is one from my experience. Quote but the best product ever. SLO is still advertising here. Props for that. Quite a few SLO sails and tramps out here on the rock. Just put one on an 18-2. I would guess that unless you are Hobie, you’re not making a fortune on catamaran parts these days. nohuhu SLO is still advertising here. Props for that. Been buying from Richard for years an never a problem.... you pay a little more, but the quality is well worth it. I have had the privalige of talking with him for extended times. often not about cat related things. Edited by MN3 on Nov 27, 2018 - 06:52 PM. I asked them to make a custom jib and main this summer for my H18 Magnum. I really like the "Blue Hawaii" pattern and they replicated it perfectly on both sails. Best looking sails on our beach IMO. 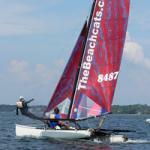 Very good quality and workmanship; hardware used on the sails is excellent. I also purchased a tramp from them last summer. When I had an issue with it this year, they sent me a replacement for free. Karl the owner is busy running a small business I think, and can be tough to reach at times, but he's gone out of his way to help me. I'd definitely give them the benefit of doubt. I would like to weigh in in this quickly. Andrew had been managing the sail department here for a number of years and did a fantastic job of it. He moved on to a 'real job' and we have just been shorthanded, especially on the technical side of sailmaking and working with customers to get them what they want. We had someone else coming up through the ranks that left for family reasons and we were left with not enough time or talent to be selling sails online where we wouldn't have control over how much people ordered. We are building sails with orders by phone and we are currently scheduled about 6 weeks out. Hopefully we'll be able to re-build the labor pool and get back to building hundreds of sails a year. On that note we are looking to hire people with sailmaking experience. This is going to be a difficult person to find but we're trying. With most sailmaking offshoring to Asia over the last 30 years there are very few lofts actually building sails start to finish in the US anymore, and thus there are very few people in the training pipeline. Thanks for the first hand info, keep at it, there is bound to be someone qualified who wants to work at a real sail loft rather than a marketing front like so many places that sell sails these days. slosailandcanvas On that note we are looking to hire people with sailmaking experience. This is going to be a difficult person to find but we're trying. With most sailmaking offshoring to Asia over the last 30 years there are very few lofts actually building sails start to finish in the US anymore, and thus there are very few people in the training pipeline. Thanks for the "official" update. Such a sad commentary on sailmaking and the lot of much US manufacturing. Offshoring has done so much damage to us all. Not sailmaking experience per se, but there are many laid off/displaced sewing pros in my area, High Point, NC the "Furniture Capital of The World." Not sure a move to Cali or the COL shock would be attractive to any folks, but there is a vast highly experienced talent pool here. Maybe a little targeted solicitation for help?